Churachandpur is a district in the southwestern corner of the Indian state of Manipur that covers an area of 4,750 kilometres. The region became the home of more than thirty ethnic groups at historical time, with varying responses to the changing geo-cultural environment. The people inhabiting both the valley and the hills are of Mongoloid origin, with common racial roots for many and with settlements in the ancient cliffs of hillsides with pattern of descent into the fertile valley below. Migrations from the east and the south east with the urge of delineate areas of settlement and subsistence led to the dispersal of groups to various nook and corners of hill ranges and at the valley below. The cleanliness of the mud houses itself, with solid roofing structure with intricate patterns in wood, bamboo strip and thatch in elaborate details indicated a well knitted patriarchal social structure. 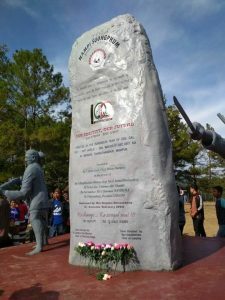 Mention may be made of festivals of the Tribals of Churachandpur were mainly , Chavang Kut, Zomi Nami, Pineapple Festival, Chapchar Kut, Sikpuoruoi, Zouton etc which are now resurgent celebrations of identification and solidarity. The Tribals have both the spear and the sword in the weapon system, and the shaping of their martial training is based on defence from all round attack, active protection of the body from thrusts and strikes, which signifies the carriage of the body of the minimum volume and dimension, yet with an inbuilt capacity to expand, to convert to spring action energizing the body to a great extent for furious attacks on the enemy. Christianity, that entered to the hills in the Late 19th Century and converted the Tribals in the 19th Century is the universal religions. Christianity modernized the Tribal people who inhibited the hilly regions of Manipur. This typical house of Churachandpur hills tribes of Manipur, who are inhabited in the districts of Churachandpur and Sadar Hills, is known as Malai Inn. The house is 11.10 m. and 4.80 m. in length and breath respectively. There are pillars, lower horizontal beams, cross beams and lower roof supports that all made of wood. 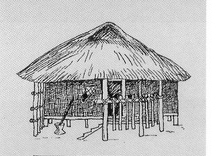 The roof of this house is covered with thatch and used bamboo split for upper roof supports. The wooden plank is important for making pile dwelling. The mate of bamboo chip makes the wall of the house. The wild creepers and paya (a kind of thing that tightening two joining) are used to fasten the joining of the house. There is a fireplace in the house. We exhibited the Facsimiles of stone inscriptions that we found in Manipur in this traditional house. Here, we also displayed the photographs of the coins, which were the currencies of the different states of Northeast India. (Original coins are exhibited on request). The various coins and notes of Southeast Asia are also displayed in this house.